Welcome to Down On The Street, where we admire old vehicles found parked on the streets of the Island That Rust Forgot: Alameda, California. 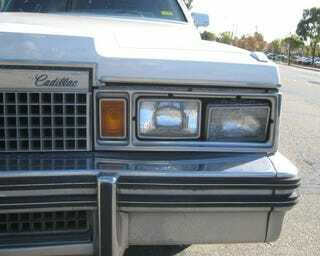 Cadillacs sold pretty well, even after most of a decade of Malaise-y gas prices and general sense of diminished expectations, so you could still buy a great big angular slab of rear-wheel-drive Fleetwood as late as 1984. Here we've got a raggedy '79 Fleetwood that's been sitting on a major commercial strip for a couple of weeks now. This stretch of road is a popular spot to park cars for sale, since the traffic is so heavy. This Caddy, however, has no For Sale sign in sight; it may belong to the resident of a nearby apartment building, or it may be abandoned (this car has the telltale purple window tint, indicating that it is probably on its last owner). The APD is vigilant about this sort of thing, so a date with a tow truck may be in the offing. These things listed at $21,735 from the factory, or about 65 grand in 2008 dollars. Power was provided by a 195-horse 425 (with 320 foot-pounds-o-torque, so it wasn't as sluggish as the horsepower number indicates).